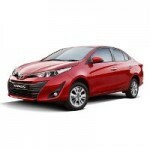 * Features mentioned here for the Toyota Yaris J MT are indicative only and subject to changes. Kindly contact Toyota dealers for features list. Toyota reserves the right to make any changes without notice concerning equipement or discontinue individual models.